So, I *have* made progress on my socks, both the green one on a circ and the Noro one on DPNs, *and* I started the amigurumi koala for the store sample, but I’ve finished none of those. So, I don’t have any craft FOs. BUT, I did finish Mirror’s Edge on the Xbox today! Now, Mirror’s Edge isn’t really a new game at all, but I had fallen in love with it from the trailers after it came out, and then the reviews were really varied, so I ummed and ahhed for ages. I finally bought it and started it, and fell in -proper- love with it. But, for all my love, it’s one seriously frustrating game, and I put it on ice for a while. I’d been playing Resident Evil 5 recently, until I could go no further due to a scratched disc (heartbroken! ), so I gave it another bash. 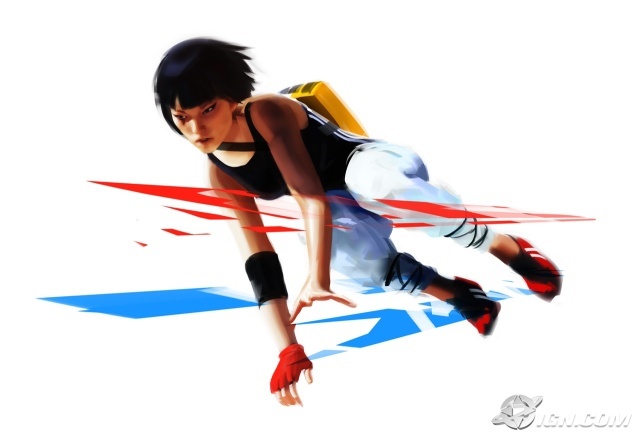 If you’re not familiar with Mirror’s Edge, storyline aside, your character is a parkour dynamo; you run across rooftops, finding jumps and sliding through gaps and you build up your speed. And that’s the game’s charm. Once you’ve figured your course, it’s incredibly exhilarating to execute each jump and roll and flying fox in one smooth sequence. And to me, that’s reason enough to play this game. It’s actually really short all told, I finished it in two days or so. If you should pick this game up and play it; you will die. A lot. In same cases, you almost have to sacrifice yourself in order to finish it; by which I mean, to find the way through the level you’ll either have to die from trial and error until you figure out the right order of things, or you’ll have to be gunned down a few times while you explore so you can make your escape on the final try. This is one of the reasons I put it down the first time, but if you can stick with you’ll be rewarded. It’s an incredibly original, visually stunning game, and there’s really nothing else like it. And the exhilaration of nailing a path makes all the frustration worth it.